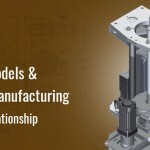 Design for Manufacturing (DFM) and Design for Assembly (DFA) strategies are well known in the design engineering community. 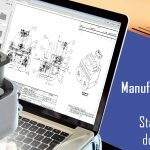 While DFM is all about optimizing the part design for manufacturing feasibility and bringing down costs, DFA is meant to reduce cost by making the assembly process easy. While both these approaches are required to keep the product development process efficient and cost-effective, these are no longer required when it comes to Additive Manufacturing. With this new paradigm in product design, there is however a need of Design for Additive Manufacturing (DFAM). Building a product no longer requires multiple parts to be assembled together, but the product can be printed as one single metal piece. As an example, NASA’s rocket fuel injector which required 200 parts were reduced to just two parts using 3D printing. But this doesn’t mean that they simply uploaded the CAD assembly of the injector for the 3D printer and the printer itself converted the injector assembly into two parts. They required completely re-designing the injector from scratch, using the DFAM strategy. 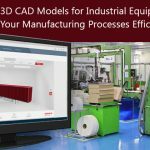 Since additive manufacturing is totally different from conventional injection molding and CNC machining, you will have to think fresh about the design and forget everything about DFM or DFA. Shrinkage allowances, draft angles or designing for mating surfaces are no longer required, since the printer software automatically compensates for shrinkage based on the material chosen. Thus, old design concepts developed considering these factors must be eliminated. You need to think how 3D printing can develop designs that were not possible before? Additive manufacturing is possible through number of printing technologies, each having its own merits and demerits. While some techniques can provide parts with good surface finish, some provide good strength to the part. It is also important to know which material you will be using right before even starting your design in CAD. Techniques like PolyJet or Stereolithography (SLA) are useful to develop non-functional, but a good surface finished prototype. For functional part, Fused Deposition Modeling (FDM) is highly suitable, but required additional machining for good surface finish. Almost every rapid prototyping technique requires support structure. This is mainly to print overhangs, anchor the part to the print bed to maintain stability and reduce distortion. In case of FDM, there are two options for support material: soluble or breakaway. Soluble type is more suitable for complex parts and you only require the final part to be immersed in alkaline heat bath to dissolve the support material. Breakaway type on the contrary is more suitable for parts containing embedded electronics. Both the types are to be selected carefully, to ensure that while their removal, the original geometry is not damaged. Depending on the material and printing technique selected, you will also need to determine the finishing process in early stages itself. Part developed using materials like ULTEM can be applied surface finishing processes like shot blasting, dry or wet sanding and can be finished even by using centrifugal and vibratory systems. However, the aggressive vibratory system can damage thin parts and as such it is important to strengthen these weaker parts. Every printer has a minimum layer height that it can print, and it is important that the parts that you have designed are developed considering this minimum layer height. For example, if you want to print a 2.4mm surface, with a printer’s minimum layer height of 0.254mm, the part will not be printed accurately. Instead, the surface should be given the height in multiples of the layer height. Thus, a surface with 2.286 or 2.54mm will print the part accurately. It is also important to give enough strength to the walls to ensure that they do not collapse or distort. With FDM, the walls must be at least two filaments thick and must be in multiples of the filament track width to ensure accuracy. 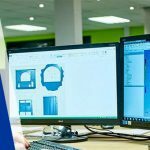 Today, leading CAD tools like SOLIDWORKS, Inventor and Creo have integrated design features to support 3D printing. 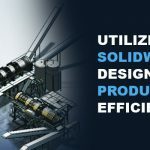 You no longer require developing a design in one package and converting it into a different format for simulation and again send it back to the native system for changes. Everything can be done in a single environment. However, it is equally important to make sure that your STL file for printing is optimized properly. Most tools provide the option of improving the resolution of facets that represent the polygonal geometry. Refining the facets will improve the part finish but will also increase the processing time. The strength of the parts being printed depends a lot on how they are laid in the printer software. Since STL parts carry only surface information, part orientation must be done manually. Also, in FDM, parts developed are anisotropic, which means that the properties are not uniform in all the directions and differ with build orientation. To maximize strength, it is good to print them in a manner were mechanical forces are distributed longitudinally along the filament length. Thus, DFAM requires thinking fresh and forgetting about old design methods and rules. Make sure that parts are developed in a manner to facilitate removal of support material and make the most of software tools to do most of the tasks for you.